Ahh, the sea... once it casts it's spell, it holds one in it's net of wonder forever. Yesterday afternoon we left our dock for a short trip to Wallace Island, just to make sure we have everything working as it should. We managed to get some sailing in on the way home today, but in this area the winds are hit and miss. Our grandson, Aiden, came along for the trip, enjoying a romp in the woods on Wallace Island with Maggie. Keeping warm in Alaskan waters. 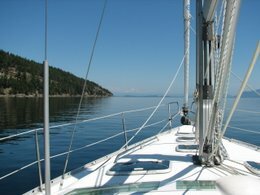 Kathy & Jerry.......love exploring the Gulf Islands and coastal waters of British Columbia on our sailboat. We also have become fond of exploring central Mexico during the winter months, and hanging out in the small town of Ajijic. We hope our photos and blogging will give you the chance to experience the same, and maybe inspire you to do some exploring yourself. We welcome aboard our newest crew.... Maggie. She joined our family this spring on March 23. She celebrated her first birthday on April 27th. She is very smart, so we are hopeful that she will learn her new duties quickly. Splendid Mane is a 2002 Beneteau 393, 40 feet in lenght. We have radar, color chartplotter, 56 hp yanmar engine, autopilot, autostream feathering propeller, dingy with 6hp engine, dodger with full enclosure, two staterooms, two heads, fully equipped galley, and lots more extras. It is a safe, comfortable boat for two people but would be easy to sail singlehanded as well. Anchoring Article Series nearing Completion!